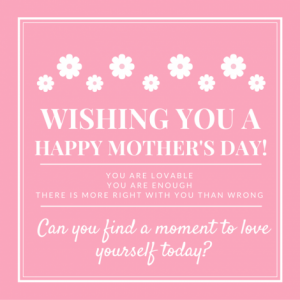 It is that time of year – Mother’s Day. For years, I worried I might never get the chance to become a mother. I was not totally sure, growing up with a physical disability, that I would be able to have children. I was even less sure that I could find a good partner who would want to spend his life with me. I look back now, years later, and wish I could reassure that young woman that – yes, she can be a mother, and yes, she is worth sharing a life with. Part of my insecurities as a young adult stemmed from another disability – depression. I have had episodes of depression since I was an adolescent, and like my physical disability, the depression is always there. It comes in waves, and there are times when it’s more in the background of my life instead of the foreground. I am a psychologist by profession, so, I, of all people should know that the stigma about mental health disabilities is unfair and unfounded. So many of us have a mental health disability, but we rarely, if ever, talk about it. This is the first time I have ever disclosed my depression publicly. Why now? Why Mother’s Day? I think one reason I have been so private about my depression is that I am afraid people will insist that it’s because of my physical disability. Outsiders assume that being disabled must be miserable, so of course we would be depressed! This flies in the face of our advocacy efforts to get others to understand that our bodies are not the problem – that the problem is attitudes and architecture and exclusion and prejudice. I’ve worried that admitting I have depression will somehow confirm the very thing I’ve spent my life fighting against: that disability is bad. I honestly would not change my physical disability even if I could; my disability is an important and valuable part of me that I would hate to give up. But I loathe a lot of things that come with having a disability. The expense of driving an adapted vehicle and relying on a sophisticated power wheelchair for mobility (In saying this I am aware of my privilege to drive and have access to a fancy wheelchair, as so many in our community go without). There are other things that are frustrating – everyday hassles and microaggressions that over time wear me down. I’m tired of being stared at. I’m sick of my son being asked what’s wrong with his mom. I’m annoyed by how difficult it is to wedge my power wheelchair into the kids bathroom to give them a bath. Living with a disability is hard sometimes, and it’s no wonder that the exhaustion of it all could make our mental health vulnerable. But guess what? There doesn’t have to be a reason for depression. Mental health disabilities like depression are invisible, but completely real. The causes and treatments are complex and multifaceted. But we hide our mental health disabilities and we often don’t get treatment. We isolate and blame ourselves, which makes our symptoms worse. We would never do that that if we had cancer or another illness. It’s time to stop hiding and start talking about it. 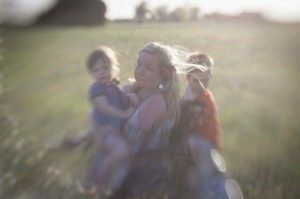 I struggle sometimes as a mother with a mental health disability; my depression tries to tell me I’m a terrible mother, that I’m not good enough, and that I don’t deserve to be happy. That I am a miserable person. It makes it harder to be patient with my little ones, and easier to become frustrated. It makes me irritable for no reason. Sometimes it tries to convince me that my family would be better off without me. I worry that my children will have depression one day too, or that having a mother with depression will harm them. I feel guilty at times when I look around my at my precious family and instead of feeling joy, I feel empty. I feel guilty that I could be so selfish as to feel depressed when I have everything I have ever wanted, and much, much more than most people. It’s not always that way. There are many other times that I feel happy and I always feel grateful for the privilege of being their mother. No one is happy all the time. No family is perfect. This year, for Mother’s Day, I’ve decided to give myself a gift, the gift of compassion. I work with people every day struggling with mental health disabilities and I am in awe of their strength and resiliency. Rarely do I think about myself with that admiration. But the truth is, I am incredibly strong. No matter how bad I slept and how forcefully my depression tries to tell me that it’s not worth it to get up in the morning, I get up. I get my son ready for school and fix him breakfast and get him off to school. Always. No matter how awful I feel, I read my little ones books each night and tuck them in to bed just so. Every night. I work hard, long hours at a stressful job to provide a stable home and meet my children’s need. I don’t give up. Ever. I own it when I snap at my husband. I tell him I’m sorry, and I work to make my actions mirror the love in my heart for him. Each time. Our expectations for ourselves are so high. We should pack perfectly healthy lunches for our kiddos every day, and eat nothing but spinach ourselves. We must excel at work and advance in our careers. 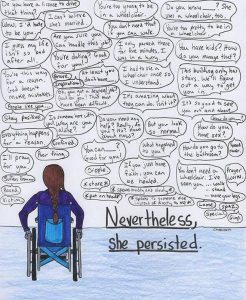 We need to be disability advocates, and get involved politically, and champion feminism, and work on grassroots movements. We should have a clean house, and keep up with the laundry and stay on top of the dishes. We must volunteer and give back to the community. We need to spend time with our children, exposing them to new experiences and ideas. We should cultivate our relationships with our partners. We must endeavor to stay connected with our friends. We need to remember the holidays and the birthdays and stay in touch with cherished family members. I could go on. And on. And on. Yes, yes. We do these things. Some of the time. We cannot do all of the things all of the time. No one can do all of the things all of the time. Turning away from the mess in my house, and ignoring nagging thoughts about what I should I should be doing, I notice my daughter, who looks exactly like me, and I am blown away by her beauty. My beauty. I am so impressed by her feistiness. She got that from me. I see such kindness in my son, and I’m humbled by his generosity of spirit. His curiosity is infectious. He got a lot of that from me. Seeing children through the eyes of their mother is amazing. I love them so very much. I love that I created them and I love the things about me that I notice in them. Some of the very things I once hated in myself. So this Mother’s Day, I plan to relax and enjoy my family. Stay in the moment and be truly present. My children have an imperfect mother, and in this way they are able to learn how to love unconditionally. Facing depression is a part of my life, and they too will face challenges of their own. They are both so unique and delightful, and they each have annoying habits and trying behaviors. They make awful messes and dry out all the markers. They are perfectly imperfect. I only hope that I will be able to teach them to love themselves in the same way I love them – exactly the way they are. We must lead by example, and for me, that means giving myself the love and acceptance I deserve. Join me, mama. You totally expressed so many of the feelings I had and occasionally still have over the years. You are so incredible!! Much love to you! Erin- This is so beautifully written. And although we have different challenges, I can see myself if much of what you write. I think that is part of your point. We ALL struggle. We all need to forgive ourselves. I know it is different, but, I clearly remember struggling with postpartum depression for years. On one hand, I was so blessed and grateful to have my children. 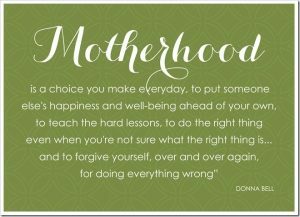 Especially my second, after suffering countless miscarriages between my girls. Intellectually, I was so happy, but also I was so agitated and short-tempered and as I called it, suffering from postpartum-bitchiness. I resisted medication (I don’t really know why) and when I finally snapped (and I am going to share something for the first time here…snapped and I threw a washcloth at my child’s head! Snapped because I was suffering from PPD, was so tired from not sleeping, tired from struggling to breastfeed all night because my child couldn’t take a bottle during the day, tired of trying to race out of the house in the morning and get the kids to daycare/school and me to work, tired from feeling guilty that I had all of these conflicting thoughts/emotions, and finally tired of my 5 year old whining when she couldn’t get dressed that particular morning because of a sensory processing disorder which was no fault of her own, I snapped and threw the cloth at her). I couldn’t believe I threw something at her. I used to have the patience of a saint. And it was all gone. It was a tiny washcloth, used with cloth diapering, it didn’t even come close to reaching her, and it probably weighed <0.25 ounce, but still, I threw it at her! I collapsed into a pile of a crying mess and apologized profusely. I called my doctor right then and asked for meds. And can you believe it, they worked! I worked through four meds, until I found Wellbutrin, and then I felt like normal again. I have many close friends and family members on anti-depression medication. And I am a firm believer that in fact, they are great to take, and there is no shame in getting help. Actually, I feel that people are stronger for getting the help they need and for taking meds. But why I felt I had to be strong and work through my "issues" on my own, I have no idea. Like you said, it's a physical health problem. Why shouldn't we seek treatment? I wish I had asked for help sooner. I lost so much quality time. Also, I can see why you would feel like you could not share your depression, because, I could see people wrongly assuming it was because of your disability. People can be so closed-minded (to put it nicely). But I feel so grateful you did. It's a human issue, not specific to any one group. I also went to counseling, and one of the things that I always remember the counselor teaching me, is the best things I could do for my children was model good behavior after I mess up. Which you write about so beautifully above. We all make mistakes, but the right thing to do is to make it right after we mess up. We all put on this front like things are always ok, and then when they are not, it can feel so lonely. So from one imperfectly-perfect human being to another, know that I think you are a stellar mother, wife, and career woman especially for sharing this and I wish you nothing but success in all of your journeys. Also, thank you for sharing your story because, it lifts us all up as women and mothers who are balancing the lives of the ones we love so dearly, the best we can. I didn't mean to write a novel, but obviously you struck a cord with me! Good for you!!! You’re so right about treatment, and what it takes to reach out for help. Thanks so much for sharing this. Shame is so toxic. I’m glad you could relate to my post. Hi Erin! We live in Austin too and my daughter has limb differences. You and your family might look into coming out to Camp No Limits Texas next year (we just got back from this year’s camp), I bet you would enjoy it, you could be a great resource for the other parents, and your kids would enjoy being among friends who don’t need to ask what is “wrong” with their mom.